The world is coming to terms with iOS 6.1 firmware which was released a couple of hours ago. This release means that the new untethered jailbreak is also around the corner. It should not be overlooked that Apple TV 2G 5.2 jailbreak will also be covered by the new jailbreak that is expected to release this Sunday. Apple TV software version 5.2 was released alongside iOS 6.1 earlier today. The new 5.2 software update is compatible with Apple TV 2G and Apple TV 3G. There have been many rumors about a full fledged Apple HDTV, but nothing concrete has materialized as yet. The fruit company’s only offering in the TV market is a nifty little set-top box they call the Apple TV. It was drastically updated when the Apple TV 2G was released and late last year Apple released a minor update and called it the Apple TV 3G. With the widespread enthusiasm of iOS 6.1 firmware, Apple TV software version 5.2 hasn’t gained enough publicity. This new software version was released earlier today and is compatible with both the second and third generation Apple TV. Minor updates and improvements have been made. There is increased support for iTunes in the Cloud as well as the Up Next feature Apple initially introduced in iTunes 11. 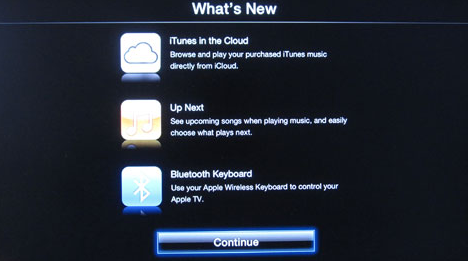 The Apple TV 5.2 software update also enables support for Bluetooth keyboards, meaning that the Apple TV can now be controlled via a wireless Bluetooth keyboard. This is the first time that Apple has officially unlocked the Bluetooth capabilities of Apple TV. It is quite easy to get this new software update for your Apple TV. The update can be downloaded directly from Apple, directly on the device by going to Apple TV settings followed by General options. On the other hand MuscleNerd has confirmed that Apple TV 2G 5.2 jailbreak will be supported by the upcoming iOS 6.0, 6.1 untethered jailbreak. This new jailbreak is expected to be released on Super Bowl Sunday, for all we know, it could very well happen before that. The third generation Apple TV running software version 5.2 will not be compatible with this new jailbreak. Only Apple TV 2G.